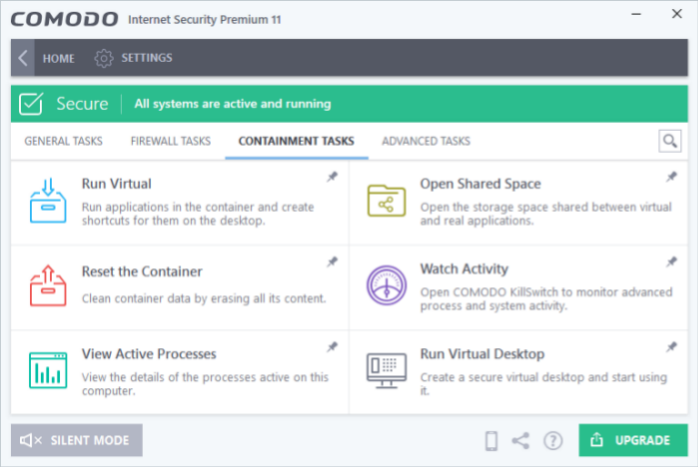 Comodo Internet Security features a secure, virtual environment called a 'container' in which you can run unknown, untrusted and suspicious applications. Contained applications are denied access to other processes, programs or data on your computer. In addition to running suspicious applications inside the container on an ad-hoc basis, you can create a desktop shortcut of programs that should always run in containment. Run Virtual - Allows you to run individual applications in the container depending on the settings configured for it. The 'Advanced Settings' interface allows you to configure the overall 'Containment' behavior. See 'Containment Settings' for more details. Open Shared Space - Opens the folder 'Shared Space' which is shared by your host operating system and the Virtual Desktop. The folder is created by the Virtual Desktop at the location 'C:/Documents and Settings/All Users/Application Data/Shared Space'. The folder can be opened in both your host operating system and inside the Virtual Desktop, and enables to share files and applications between the OS and the Virtual Desktop. Reset Container - Allows you to clear all data written by programs inside the container. Watch Activity – Allows you to open Comodo Killswitch to identify unsafe processes and manage system activity. View Active Process List - Allows you to view processes which are currently running on your PC. Clicking the 'More' button will open Comodo KillSwitch, or present you with the opportunity to install KillSwitch if you do not have it installed. Run Virtual Desktop - Starts the Virtual Desktop.